The regions of Italy (Italian: regioni) are the first-level administrative divisions of Italy, constituting its second NUTS administrative level. There are 20 regions, of which five are constitutionally given a broader amount of autonomy granted by special statutes. Each region, with the exception of the Aosta Valley, is in turn divided into a number of provinces. Regions are autonomous entities with powers defined in the Italian Constitution. As the administrative districts of the central state during the Kingdom of Italy, regions were granted a measure of political autonomy by the 1948 Italian Constitution. The original draft list comprised the Salento region (which was eventually included in the Apulia). Friuli and Venezia Giulia were separate regions, and Basilicata was named Lucania. Abruzzo and Molise were identified as separate regions in the first draft. They were later merged into Abruzzo e Molise in the final constitution of 1948. They were separated in 1963. Implementation of regional autonomy was postponed until the first Regional elections of 1970. 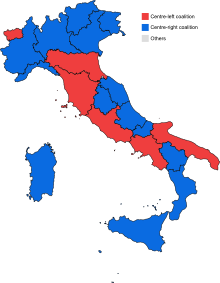 The ruling Christian Democracy party did not want the opposition Italian Communist Party to gain power in the regions, where it was historically rooted (the red belt of Emilia-Romagna, Tuscany, Umbria and the Marches). Regions acquired a significant level of autonomy following a constitutional reform in 2001 (brought about by a centre-left government and confirmed by popular referendum), which granted them residual policy competence. A further federalist reform was proposed by the regionalist party Lega Nord and in 2005, the centre-right government led by Silvio Berlusconi proposed a new reform that would have greatly increased the power of regions. The proposals, which had been particularly associated with Lega Nord, and seen by some as leading the way to a federal state, were rejected in the 2006 Italian constitutional referendum by 61.7% to 38.3%. The results varied considerably among the regions, ranging from 55.3% in favor in Veneto to 82% against in Calabria. Every region has a statute that serves as a regional constitution, determining the form of government and the fundamental principles of the organization and the functioning of the region, as prescribed by the Constitution of Italy (Article 123). Although all the regions except Tuscany define themselves in various ways as an "autonomous Region" in the first article of their Statutes, fifteen regions have ordinary statutes and five have special statutes, granting them extended autonomy. These regions, whose statutes are approved by their regional councils, were created in 1970, even though the Italian Constitution dates back to 1948. Since the constitutional reform of 2001 they have had residual legislative powers. The regions have exclusive legislative power with respect to any matters not expressly reserved to state law (Article 117). Yet their financial autonomy is quite modest: they just keep 20% of all levied taxes, mostly used to finance the region-based healthcare system. Article 116 of the Italian Constitution grants to five regions (namely Sardinia, Sicily, Trentino-Alto Adige/Südtirol, Aosta Valley and Friuli-Venezia Giulia) home rule, allowing them some legislative, administrative and financial power to a varying extent, depending on their specific statute. These regions became autonomous in order to take into account cultural differences and protect linguistic minorities. Moreover, the government wanted to prevent their secession from Italy after the Second World War. Each region has an elected parliament, called Consiglio Regionale (regional council), or Assemblea Regionale (regional assembly) in Sicily, and a government called Giunta Regionale (regional committee), headed by a governor called Presidente della Giunta Regionale (president of the regional committee) or Presidente della Regione (regional president). The latter is directly elected by the citizens of each region, with the exceptions of Aosta Valley and Trentino-Alto Adige/Südtirol, where he is chosen by the regional council. Under the 1995 electoral law, the winning coalition receives an absolute majority of seats on the council. The president chairs the giunta, and nominates or dismisses its members, called assessori. If the directly elected president resigns, new elections are called immediately. In Trentino-Alto Adige/Südtirol, the regional council is made up of the joint session of the two provincial councils of Trentino and of South Tyrol, and the regional governor is one of the two provincial commissioners. Number of senators currently assigned to each Region. Article 57 of the Constitution of Italy establishes that the Senate of the Italian Republic is elected on a regional basis (excluding 6 senators elected by Italians residing abroad and a small number of senators for life) by Italian citizens aged 25 or older. The 309 senators are assigned to each region proportionally according to their population. However, Article 57 of the Constitution provides that no region can have fewer than seven senators representing it, except for the Aosta Valley (which has one) and Molise (which has two). The extra-regio territory is made up of parts of the economic territory of a country which cannot be assigned to a single region. It consists of the national air-space, territorial waters and the continental shelf lying in international waters over which the country enjoys exclusive rights, territorial exclaves, deposits of oil, natural gas etc. worked by resident units. Until 2011, the gross value added (GVA) produced in the extra-regio was allocated pro-rata to the inhabited regions of the country concerned. The order of magnitude of the extra-regio GVA depends in particular on the resource endowment in terms of natural gas and oil. In 2011, Member States and the European Commission agreed to give countries the possibility to calculate regional GDP also for the extra-regio. The resulting GDP is available only in absolute values, because the extra-regio territory by definition does not have a resident population. ^ "National structures". Eurostat. Archived from the original on 13 July 2014. Retrieved 6 December 2011. ^ a b c "Speciale Referendum 2006". la Repubblica. 26 June 2006. Retrieved 6 December 2011. ^ "Population Italian Regions". tuttitalia.it. ^ Pinto, Luciano Torrente-Paolo Strazzullo-Roberto. "Statuti Regionali - Casa Editrice: Edizioni Simone". www.simone.it. ^ LL.M., Prof. Dr. Axel Tschentscher,. "ICL - Italy - Constitution". servat.unibe.ch. ^ Hiroko Kudo, “Autonomy and Managerial Innovation in Italian Regions after Constitutional Reform”, Chuo University, Faculty of Law and Graduate School of Public Policy (2008): p. 1. Retrieved on April 6, 2012 from http://www.med-eu.org/proceedings/MED1/Kudo.pdf Archived 2015-11-17 at the Wayback Machine. ^ "senato.it - XVII Legislatura - Senatori eletti nella regione Piemonte". www.senato.it. ^ a b c d e f g h "GDP per capita in the EU in 2011" (PDF). Archived from the original (PDF) on 2014-03-07. 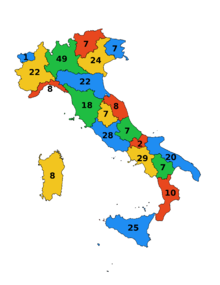 Wikimedia Commons has media related to Regions of Italy.